A 10-time X Games Gold medalist, AMA motocross champion, and a four-time drivers title winner of the Rally America, 29-year old Travis Pastrana thirst for adrenaline has been aided by a proven talent. When Pastrana announced his next thrill would come in NASCAR, there was little doubt he expected to depend heavily on his experience for winning. Last year, an effort campaigning a heavily modified Dodge Dart in the Global RallyCross Series netted a victory at the New Hampshire Motor Speedway event. 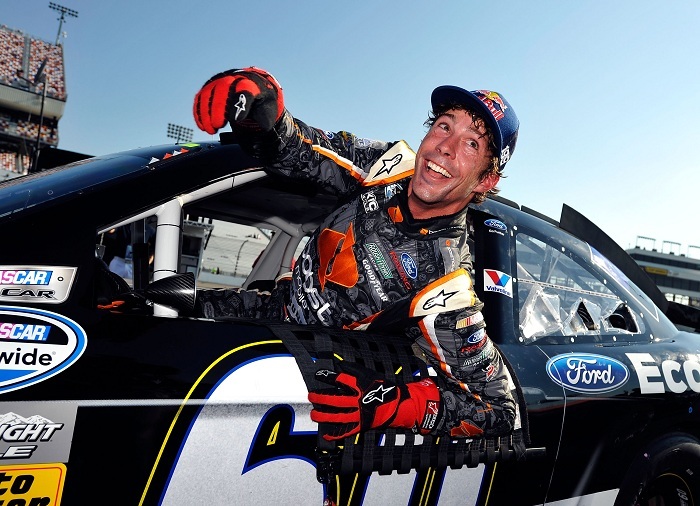 Through the course of a running select NASCAR Nationwide races in 2012, it appears the Travis Pastrana has realized the need to align himself with a top-flight racing organization in order to net the best opportunity for victory. For 2013, the multi-talented athlete is now officially signed with the team that powered 2012 NASCAR Nationwide Series champion Ricky Stenhouse Jr. Starting in his first NASCAR Nationwide Series in the April 2012 event at Richmond International Raceway, Travis Pastrana started the 2012 season with RAB Racing that ran with the co-operation of Michael Waltrip Racing. Pastrana drove the team’s #99 Toyota for the eight races finishing a season-best effort of 13th place at the Indianapolis Motor Speedway. When the NASCAR Nationwide Series returned to Richmond International Raceway for their second race in September, the experienced team of Roush-Fenway Racing approached Travis Pastrana to drive. Finishing 17th in a #60 Ford Mustang, Pastrana clearly recognized the NASCAR organization was the best fit for him as he arms himself for a full-time assault in the 2013 Nationwide Series season. Indications since November have been confirmed on Thursday as Travis Pastrana and Roush-Fenway Racing announced their association formally for 2013. “I am very serious about making this move, running competitively and ultimately winning races in NASCAR,” said Pastrana in a team release excited to be part of a team he attests is “..the maximum opportunity to develop my skills”. The winningest team in the NASCAR Nationwide Series with 131 visits to victory lane since 1988, Roush Fenway Racing’s previous two seasons resulted in their driver Ricky Stenhouse Jr winning the drivers championship. Driving the #60 Ford Mustang that is said to sport different sponsors throughout 2013, Pastrana will compete alongside teammate and 2011 Daytona 500 winner Trevor Bayne for the full 33-race season.